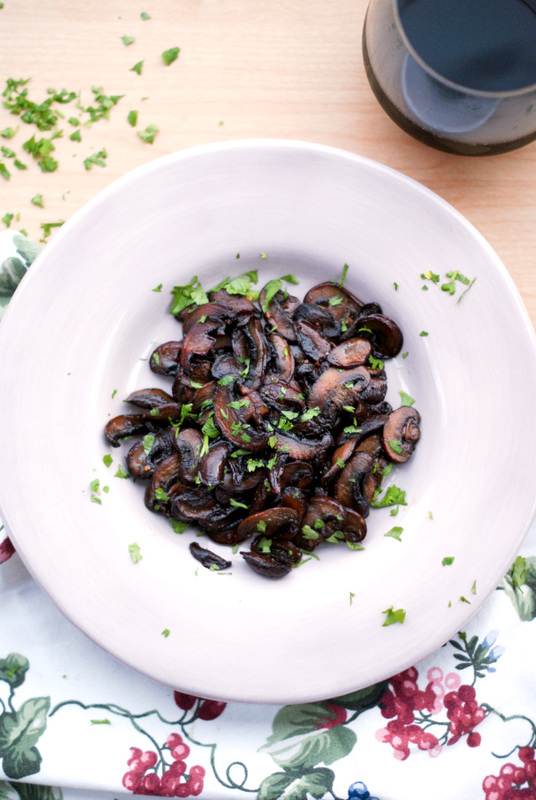 Red Wine Mushrooms are made by sauteing baby bella mushrooms in butter and oil until they are golden brown, and then simmering them in robust red wine. We are red meat fans in our house. Steaks, in particular. Just a short time ago, we moved into our new home and our grill was left behind at Grandma's until we could borrow a truck to pick it up. And we had no oven. Makes it hard to cook a good steak in that predicament. So, we went steak-less for around a month. Sad days, I tell you. It actually didn't seem so bad at the time. But when we got the grill to our new house, we, of course, fired up some big juicy t-bones, and when I took that first glorious beefy bite...it was heaven, my friends. The carnivore in me was like a ravenous beast awakening from hibernation. I know I'm being a little dramatic here, but that steak was good. Damn good. Our very favorite steak accompaniments are Caesar salad, Grilled Baked Potatoes, and Caramelized Mushrooms. 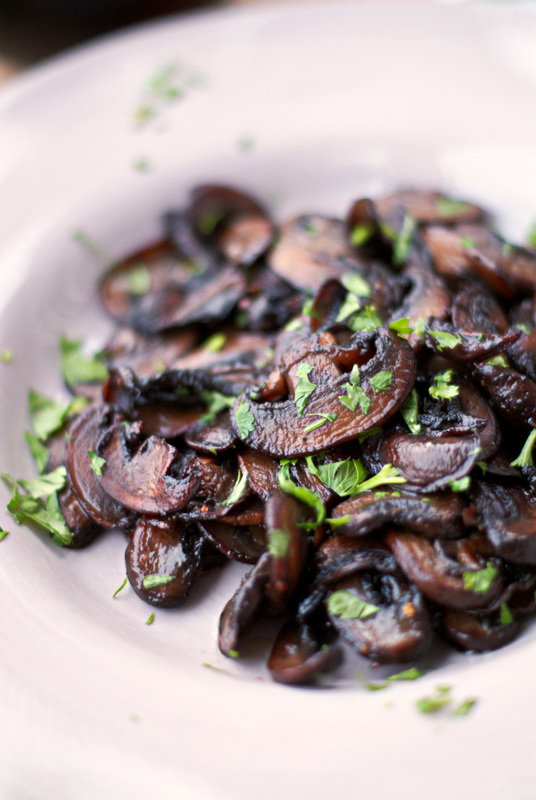 I decided to try a twist on the mushrooms that first night we had our grill back. They came out perfect! My husband and I usually split this recipe between the two of us, but you could easily stretch it to serve up to four people. Simple, elegant, and delicious! Try them the next time your grilling a steak! In a non-stick skillet, heat the butter and olive oil over medium-high heat. Add the mushrooms to the pan, season with salt and pepper, and saute for 6-8 minutes, stirring frequently, until the mushrooms are golden. Reduce heat to low and pour the wine into the skillet. Simmer until most of the wine has evaporated. Top with fresh chopped parsley and serve immediately. I'm thinking that next time I'll add some minced garlic. Yum! I used Pinot Noir for the red wine.